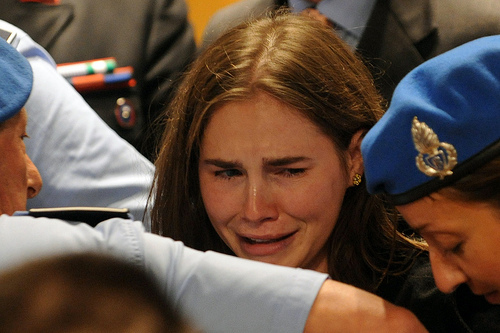 Amanda Knox’s case is headed back to court after Italy’s Supreme Court order a new murder trial for the 25-year-old who was accused of killing her roommate in 2009. If Knox is found guilty and the Court upholds that verdict, she could be extradited and imprisoned in Italy. An extradition request “would likely turn on whether being prosecuted again after being exonerated constitutes double jeopardy,” reports ABC News. Knox and her ex-boyfriend were convicted of the crime in 2009 and sentenced to 26 and 25 years in jail, respectively. After spending four years in prison, Knox’s case was overturned after an appeals court ruled that the evidence used to prosecute her was invalid. Thailand regularly returns fugitives to their home countries on the basis of outstanding criminal records or the extradition process. Knox will not be returning to Italy when proceedings begin early next year. This means she won’t be able to testify on her own behalf, make statements in defense after testimonies, likely putting her lawyers at a disadvantage. In addition, her absence in court could be viewed as contempt of court. ABC News reports that no matter what the outcome of the trial is, the case will probably be appealed. If Knox is convicted in the appeal, she could be extradited to Italy and imprisoned. Law pundits say there is room to fight extradition, given Americans constitutional principles against double jeopardy.